I work part-time at a clothing store and when I use the word “red” with “shirt” or “dress” in the same sentence while suggesting a stylish article of clothing to try on, some women’s eyes bug out and they start to frown. I don’t even think they realize it! In short, they have an internal freak out. When I mention the color red, many women instantly picture a bright, candy red, as you can see in the pictured color palette below (courtesy of Digital Synopsis). However, as a color fanatic, I love any shade of red. 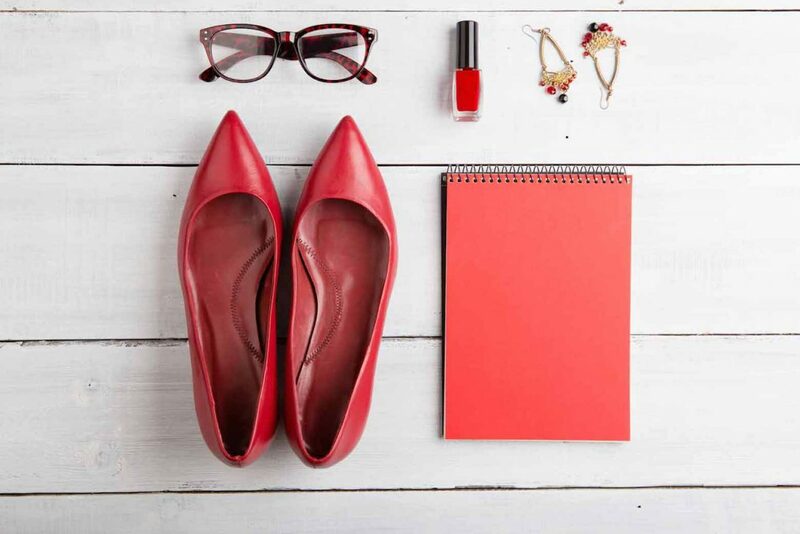 So my two-part goal in this article is: 1. to expand your shades of red color vocabulary and 2. to teach you that there is a flattering shade of red (or multiple shades!) that works for each skin tone. This fall and winter, many of the beautiful, rich shades of red are making their debut in every clothing store. You’ll see tops, jackets, pants, dresses, and of course, lips that range from crimson to wine. Now, it’s time to discover the shades of red that work with each skin tone! Fair Skin with Cool Undertones: Cherry, ruby, scarlet, and apple would add some warmth to the skin. These shades lie in-between the bright and dark shades of red so as to avoid harshness. Fair Skin with Naturally Red Hair: The cool, brighter candy red will play up red hair in the best way! Medium-Light Skin: Shades like blood and lipstick complement this skin tone the most. These luscious, darker colors perfect warmer skin tones. Golden Skin: Women with this type of coloring can rock a variety of shades from a deep, vivid red such as ruby to a vampy red such as jam. Medium Skin with Yellow Undertones: These women are lucky because they can “wow” in orange-y reds like candy red but with a tiny bit of tangerine. Don’t be afraid to wear this shade of red, even if you have brunette hair. Some women shy away from orange-y reds because they don’t believe orange pairs well with brown hair, but if you have medium skin with yellow undertones, give this shade a second chance! Tan Skin with Warm Undertones: Women with this coloring can also wear orange-y red along with candy, and even brick. Tan Skin with Cool Undertones: This skin tone looks amazing with any deep red such as garnet. Dark Skin with Warm Undertones: This skin tone pairs well with shades such as ruby, cherry, and lipstick. Shades such as these are a gorgeous contrast on dark skin. Dark Skin with Cool Undertones: Ladies who have this skin tone can wear almost any shade. Berry would look especially flattering! If you’re still doubtful about vivid reds, even if they may work with your skin tone, anyone can play it safe with deeper shades like blood and currant. Let’s be real—despite skin tone and warm or cool undertones, many women can sport darker reds and look amazing. There’s something so romantic about deep shades of red. There are no rules in fashion, but there are tools that women can use to help them discover what flatters their uniqueness the most! Looking for the perfect red pout? Don’t miss 4 Dark Lip Colors You Can Rock (on Any Budget). For more fashion articles and advice, check out 5 Sweaters That Will Make You Feel Cozy and Classy, 5 Reasons Why Sorel Boots Are the Perfect Fall Investment, What to Wear When You Feel Less Confident, 5 Colors Every Woman Can Look Great In, How to Wear White Jeans All Year-Round, and 8 Brands to Follow That Love Every Kind of Body.